On June 17, 2007, there was a knifing incident in Paris, involving Iranians. Until the French police and court system sort through the conflicting evidence, both sides are posting evidence supporting their accounts. Cult leader Massoud Rajavi gives go-ahead to kill witnesses in European countries. A communiqué was issued on June 07, 2007 by the Mojahedin Khalq Organisation (MKO)'s cult leader Massoud Rajavi, who has been a fugitive since the fall of Saddam Hussein in . In the communiqué, Rajavi names three people, including myself, who are witnesses in the on-going investigation against the cult by the French Judiciary, and specifically describes them as "the agents of the Iranian secret services". For those familiar with the MKO cult, this is clearly understood to be Rajavi's method of issuing a death sentence to be carried out by his followers. On June 17, 2007 over 50 people associated with the MKO cult lay in wait to attack a public meeting in Paris at which the three persons mentioned above were among the invitees. It was later revealed that the attack had been orchestrated from the MKO cult HQ in Auvers-sur-Oise. According to French police, the assailants in this violent attack had been transferred to from other European countries. None had French documents, some had false documents. The attackers also filmed their activities at the scene. This was reminiscent of the series of orchestrated self-immolations following the arrest of the cult leader's wife Maryam Rajavi in June 2003, which were also filmed by the cult's activists. There is evidence that at least some part of the military-style operation on June 17 had targeted the three individuals named in Massoud Rajavi's recent communiqué in an assassination attempt. The incident is currently being investigated by French police. There is clear evidence that some of those involved in the violent attack were MKO militants trained by Saddam Hussein in who had been sent directly from Camp Ashraf to European countries in the past few months. Camp Ashraf is of course guarded by the American Army in . Following the capture of Camp Ashraf terrorist base in 2003, US officials – both military and civil - processed all the captured combatants, taking DNA and fingerprint evidence and issuing them with ID cards. Several of these people have been recently seen in the , , and participating in MKO activities in the EU. It is clear that responsibility for the lives of people attacked by a terrorist organisation which is apparently favoured by some Israeli lobbies and neo-conservative circles to be used to carry out terrorist acts against Iranians, Iraqis and others, cannot be laid at the door of the cult itself, but must rest with the people who have been maintaining them as a terrorist force whether in Iraq or in Europe and North America. Those who have refused to dismantle the MKO's infrastructure and continue to support them financially as well as loosening their leashes in western countries will be held accountable for any harm which comes to those either directly named and threatened by Massoud Rajavi or to any others who are harmed by implication. Why the Cult Resorts to Bludgeoning in Europe ! Over fifty attackers were arrested by police at the scene. From among the invited guests Mr Sobhani was arrested by mistake and was subsequently released. He has filed a complaint against Mohammad Hayati, a known MKO terrorist who had been transferred from (and back again) to act as 'military commander' at the scene. This 9 minute, 22 second video shows the knifing incident. The producer of this video blames agents of the Iranian regime for attacking Iranian dissidents. This video lists the names of some of the agents of the Iranian regime attending the June 17th event in Paris . This 9 minute, 57 second video shows an interview with a man who needed 20 stitches in the stomach region and treatment for a broken finger. This video shows clearly a man carrying a knife. The hospitalized man and some witnesses blamed the attacks on agents of the Iranian regime. 1. Both sides have posted evidence of injuries. Iran-Interlink has posted photographs of an injured Mohammad-Hossein Sobhani. While the YouTube videos list the names of many persons who oppose the Iranian Communist MEK (MKO, PMOI, NCRI, Rajavi Cult, or Pol Pot of Iran), the producer of the YouTube videos was not as generous with the names and political affiliations of the producers of the videos, the hospitalized man, and of the witnesses. Hopefully, viewers of these videos will recognize some of the Iranians involved in the incident. 2. 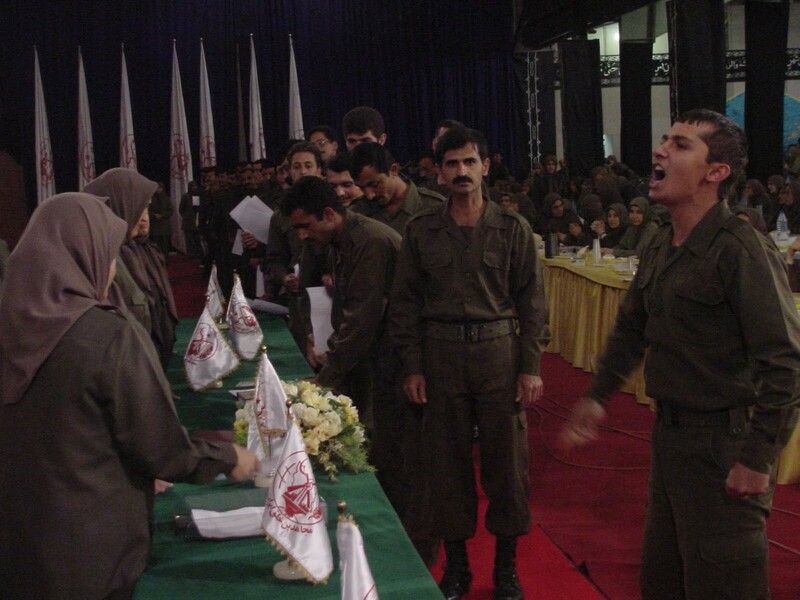 The Rajavi Cult has a history of attempting to disrupt any public meeting held by opponents. While Rajavi cultists claim to support democracy, their actions at meetings of political opponents reveal their true totalitarian nature. The common knowledge of this cult behavior about disrupting meetings could mean that some Iranians might want to stop the disruptions. By contrast, Rajavi cultists like to hold many of their meetings in secret (without inviting the public to attend). 3. The YouTube videos show three persons arrested by the French police, including Mohammad-Hossein Sobhani. According to Iran-Interlink, the French police have released Sobhani after realizing that he was a victim in the incident. Any future court documents will help to sort who the French police regarded as attackers and as victims. 4. The YouTube videos show that the French police were not present at the start of the knifing incident. Years ago in California , I attended a public meeting including large numbers of MEK supporters and opponents. There were probably 50 to 75 riot police present at the meeting because the meeting included both large numbers of MEK members and the Iranian ambassador to the United Nations. Police officials everywhere need to be aware of the risks of any meetings attended by the MEK. 5. Both Iran-Interlink and the producer of the YouTube videos appear very confident that the French police and courts will support their accounts of the events of June 17. This is probably only the beginning of a large number of postings of documents, articles, and of videos on this subject. If you have any links to future evidence on this incident, please email the links to me for posting.